It's the thirteenth, and today's prompt is quite challenging for me. It says to 'describe one underappreciated book EVERYONE should read'. I'm not the type of person who likes to recommend books to other people in the first place. So this challenge is quite difficult for me because I understand that people have different likings towards books. But I will try my best and share a book that I think is a little bit underappreciated and doesn't get the attention it deserved. 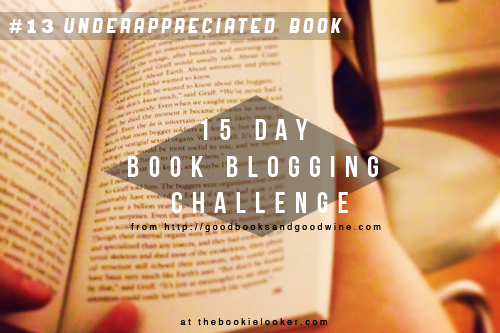 Have you ever read a book that's good but underappreciated? Share it in the comments, or join the challenge here. ummm.... I actually thought for a longgg time before deciding, and I even look through my reviews list (and also other blogs to get inspiration), because most of the books I read are not that underrated. 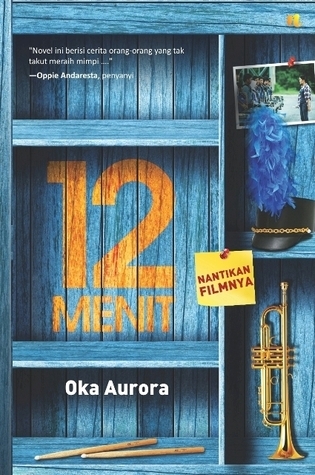 So finally I've decided on a local fiction book, titled 12 Menit by Oka Aurora (my review here). Seeing that there are only 33 ratings in goodreads for this book right now, I assume not many people have read this book (because goodreads represents most readers, i think?). I read this book last month, in July, and I personally think it's a very good book - full of inspiration and motivation. It's a story about a marching band from a small town but with incredible talents. But because they're from a small town, they start to lose confidence when they're about to compete in the national championship. Although their coach tried to motivate them and build their confidence, the problem doesn't stop there. Several members are facing dreadful problems of their own. But what they have in common is that they have the same dream: to win the competition. The book itself is an adaptation from the movie scenario (I think the movie's going to be released soon); but I personally enjoyed the writing style of the author. I wouldn't really recommend EVERYONE to read this, because I know for sure that there will be some people who wouldn't enjoy this kind of book. You can read my review on this book to know more about it, then decide whether it would suit your liking or not.